I can’t believe we are nearly in 2014! This year has gone so fast and so much has happened. A highlight was definitely performing the French National Anthem at the All Blacks test match in June BUT performing the New Zealand National Anthem at the final Bledisloe game was out of this world. Thank you NZRU for believing in me! Another highlight has been my growing relationship with the amazing Royal New Zealand Navy Band . Having met their Musical Director while I was busking on the street in Devonport Auckland, I have had the opportunity to perform with them at numerous events around the North Island. 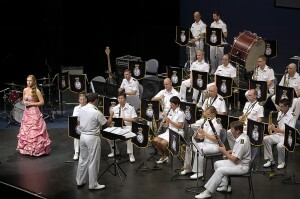 I have found a new respect for military musicians, these people are amazing! Back in February I performed my own show at the Hamilton Garden Arts Festival. I had such a beautiful back drop (gardens and a lake with ducks taking flight) and of course a wonderful audience. I finally organised a show in Akaroa where I was able to perform for the local community (they had been asking for a while) I had such a great turn out and wonderful support from the township. As we all know I do my fair share of busking, but my time on the streets is coming to an end. My career is growing which is exciting and new adventures are about to begin. I will be busy in 2014 cruising, teaching when I can and also have some other exciting opportunities on my radar. Thank you all for your support and encouragement! Without your wonderful comments it would be hard to keep going but I always say I am very blessed to be able to do what I love as my job – every day is a new adventure and I am ready for 2014 BRING IT ON! !